New model MTV3700TD available this September! 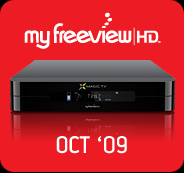 In September 2011 Pixel Magic Systems will launch a new model Dual Tuner Recorder specifically designed for New Zealand MyFreeview|HD broadcasts. In October 2009 Pixel Magic Systems will launch a new Digital Terrestrial Dual Tuner Recorder specifically designed for New Zealand MyFreeview|HD broadcasts. Already a huge success in Hong Kong, Magic TV™ brings their best value package yet to New Zealand. 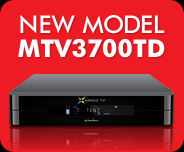 Featuring Twin HD Tuners, a 500GB Hard Disk Drive (HDD) and many unique extras, Magic TV™ will be available from all leading electrical retailers.